The sun rose, as it does every day; but today wasn’t just any day. 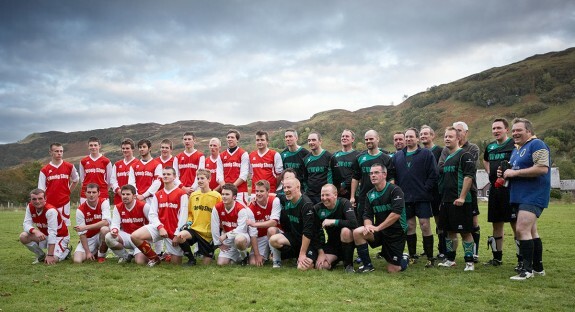 Today was the day legends of yesteryear were to return to their former stomping ground, bidding to show the new generation, that they could still play ball, could still make that tackle, could still run from one side of the pitch to the other without stopping for breath (some of these were achieved). The names of MacDonald, MacLeod, MacKaskill, MacPherson, MacRae, Davidson, Kennedy and Croy hadn’t been called for many years on the famous Glenelg turf, but today was the day the locals could witness their former heroes once again take the field…….and of course run up a hefty bar bill post match at the Glenelg Inn. Fans young and old from within the community, and beyond, turned out in their masses. Youngsters looked on starry eyed, as they not only got a chance to see their current heroes, but also, the “The Legends”! Both teams on paper looked very strong, however the over thirties were rocked by the news of Charlie MacDonald succumbing to injury and failing a late fitness test. 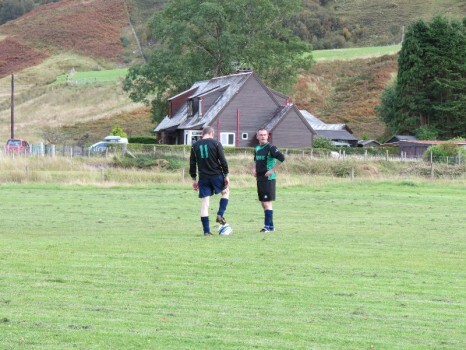 Teams arrived in good time for the match, in order to prepare physically and mentally for the battle ahead, a quick chat with team mates seemed to do the trick, and the referee kept up the old Glenelg tradition of being punctual, by turning up 15 minutes into the game!! As was common in years gone by, there was the desperate search for a referee within the gathering crowd……step forward Colin MacDonald. The lean green (and black) fighting machine ready for kick off. The game got underway, and the feast of football was upon us. The ball was being stroked about the majestic looking pitch…one youngster was heard saying it was amazing seeing Barcelona and Real Madrid play in Glenelg. 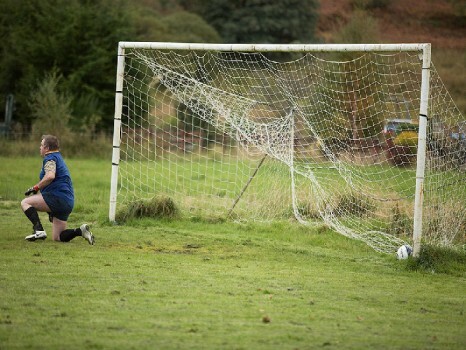 On ten minutes, in a typical slick move from the over 30s, Angus Davidson ran on to an exquisite “punt” forward, only to tumble in the box…PENALTY! The crowd went mad, the under 30’s objected, the over 30s were just shocked to find themselves in the penalty area. In a fantastic show of honesty though, Davidson held his hands up and denied he had been fouled. Play resumed, with the over 30’s stoking the ball around quite nicely, and the youngsters looking to use their pace on the break. Play was very even, until the ball broke to Gordon MacDonald on the edge of the six yard box, and he made no mistake in drilling the ball low into the goal. 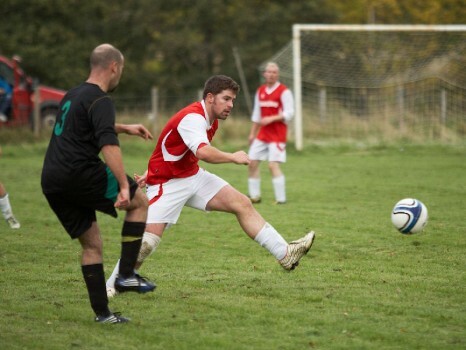 The over 30s didn’t let this set back affect their game plan, and they kept the ball moving around very well. Calls of “Ole” started to be heard from the crowd. It took a special goal from Jordan Fraser on 25 minutes to silence the over thirty support. The ball played forward to the edge of the 18 yard box, and Fraser thumped the ball into the far left corner, leaving keeper MacPherson with no chance. As half time arrived, there were cheers from all those wearing the black of the over thirties, until they realised it was just half time! Large volumes of fluids were consumed, several “energy fags”, and possibly a wee dram or two were taken on board as players prepared to re-enter the battle field. The second half carried on where the first left off, with good passing from the overs, fast breaks from the unders, and hard tackles from both. Then a moment that could have changed the game; On 65 minutes, Ronnie MacDonald, who had been galloping up and down the right wing like it was 1990, saw his shot hit off the bar. Had that gone in, it would have made for a nervous closing 25 minutes. All doubt over the result was dispelled, after Craig Wilson, brought in by the under thirties from league champions Kyleakin, tapped home from 1 yard, after Roddy MacPherson made a brilliant save. Wilson was alert to the loose ball, and scored, much to the displeasure of the pro over thirties crowd. 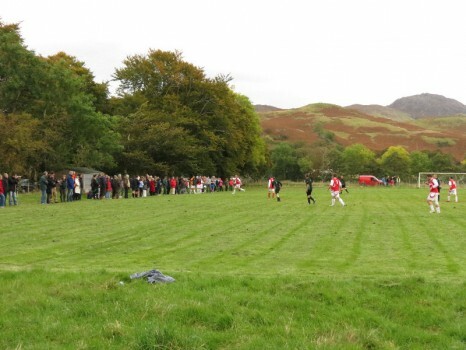 A great village turn out for the match. The closing 10 minutes naturally slowed down, with the under thirties happy the job was done, and the over thirties starting to tire. The over thirties however, started to find a second wind, as the crowd got behind them, including the members of the under thirty team on the side-lines, willing them forward to get a goal….and they got it! Persistence paid off, and after bursting into the box for one last attack, a penalty was awarded…for what we are not sure, technology isn’t arriving in Glenelg till next season, but it was a penalty none the less. Over thirties captain James Davidson took responsibility, and tucked the ball home to the biggest cheer of the night. Actually, correction, the biggest cheer of the night was at the final whistle, when the players realised they could go to the pub and reflect on a fantastic game of football. The trophy was presented to under thirties captain Kyle Nolan by “Y” MacLeod, and was quickly filled, and emptied of Glenfiddich. This game showed everything that is great about Glenelg, and its football team. Players past and present and supporters gathering together, and playing out a highly competitive game before retiring to the pub to discuss the finer points of the game. In what was the second of an annual match between the two teams, we have many great years of football to look forward to, with many youngsters coming through into the current team, and a few of the more senior under thirties soon making the step up (or down depending on your view point) in the coming years. It also proved, that many of the “more experienced” players, who have taken a step back from playing, could still have much to offer. Hopefully the support will continue for what is a fantastic football club (even if results don’t look great). C’MON THE GLEN!!! “Team Glenelg” – Young and not so young! 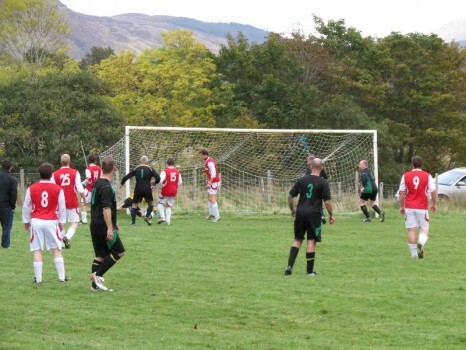 Thanks go to Grant MacLeod for the match report and Steve Lane for the photographs.